In 1941, the RLM issued a requirement for a new Zerstörer (destroyer, or heavy fighter), which called for a new design that would use components from existing aircraft, thus not disrupting existing production. After the cancellation of the Me 309 project in 1943, work was continued using it as a basis for other designs. One of these reworked designs was for the Me 509; another was for the 609, which was basically two Me 309 fuselages joined with a new center wing section. Messerschmitt was also working on and had completed a twin-fuselage Bf 109, known as the Me 109Z, but it was destroyed before flight testing. Two Me 309 fuselages were to be joined with a constant chord center wing section, into which the two inboard landing gear retracted. The two outboard landing gear retracted outwards in to the outer wing sections, with the two nose wheels retracting to the rear and rotating 90 degrees to lie flat beneath the engines. Power was to be supplied by two Daimler Benz 603 or 605 12 cylinder inverted V liquid -cooled engines. The pilot sat in a cockpit located in the port fuselage, with the starboard cockpit canopy being faired over. Two versions were envisioned: a heavy fighter and a high-speed bomber. In the fighter version, two MK 108 30 mm cannon and two MK 103 30mm cannon were projected as the armament, with a provision for two additional MK 108 30mm cannon mounted beneath the center wing section or under the outer wing sections. In addition, either one SC 500 or two SC 250 bombs could be carried, also beneath the center wing section. The bomber version would have reduced armament, with only two MK 108 30mm cannon were to be installed. Extra fuel (1500 kg) could be carried in the faired over starboard cockpit, and the bomb load was to consist of two SC 1000 bombs which were carried beneath each fuselage. 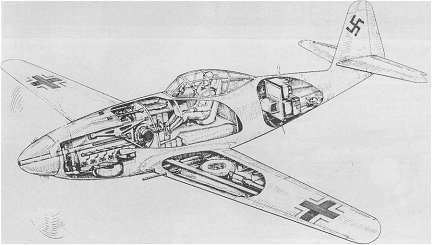 Even though it was calculated that many components of the 309 could be used (fuselage, engines, equipment, 80% of the wings), by the time this design began to jell, the Me 262 jet fighter was proving to be the plane of the future, and could take over all roles for which the Me 609 was designed. Thus, the Me 609 project was no longer pursued after 1944.